The McAllister Street Residency is a one of a kind residency complete with space to work and a small stipend. 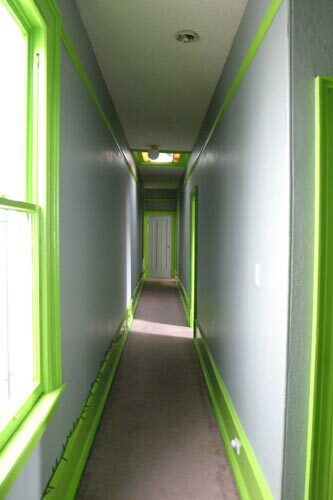 The artist-in-residence program at McAllister Street began in the winter of 2003, when the first resident painted the space gray and green in order to film a sci-fi video. The next resident simply installed a string of Christmas lights and several “night lights” (pictured) to illuminate the hallway at night. 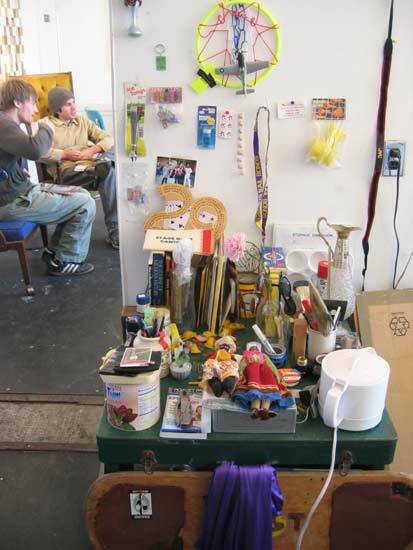 The Residency was established to give artists from all over the world a chance to work in San Francisco, and interact with the other artists who live and visit McAllister Street. Residents will be able to work in a wide array of disciplines during the week-long residency, and must creatively deal with the confines of working and showing in a space that is 3.5’ x 60’ with a 10’ dogleg (not pictured). There is access to a power drill, circular saw, reciprocating saw, chain saw, jigsaw, and several hand tools. 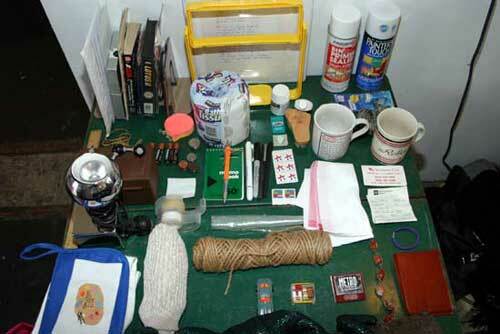 The artist is encouraged to bring his/ her own materials. Please e-mail me for more details or questions. Your proposal should answer the following questions and can be submitted either via e-mail or sent to: 1343 McAllister Street, San Francisco, CA 94115 (Attn. Marc Horowitz). 3) A letter (no more than 2 pages) indicating you interest in working at McAllister Street, a proposed project and a description. This has been cancelled due to roommate conflict among other things. 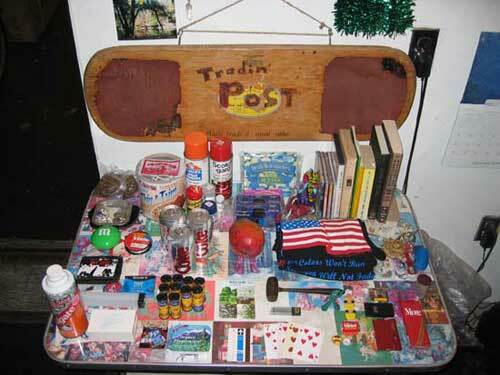 Filed under 001 Imagination, 032 McAllister Street Residency, intss blog by Marc Horowitz on Nov 10th, 2003. 1 Comment. The Tradin’ Post will be permanent ongoing installation at Mama Buzz Cafe in Oakland, CA. The only rule is that you trade of equal value. You can read a bit about it in the SF Guardian. I’m going to post pictures along the way. If you’re a business owner and would like a Tradin’ Post of your own, please contact me. Filed under 001 Imagination, 024 The Tradin' Post, intss blog by Marc Horowitz on Nov 12th, 2003. Comment. I made a sign for the Tradin’ Post using an old surf/ skateboard trainer I found at the dump. I woodburned it using a solder gun – that I do not suggest. Ah, and I got a new table!! The green one was lent by Jon Brumit and he needed it back. He gave me this wonderful folding table that has Christmas cards underneath the plastic top. Filed under 001 Imagination, 024 The Tradin' Post, intss blog by Marc Horowitz on Nov 15th, 2003. 1 Comment. Haven’t see the post in a few days. Someone made a dread catcher with a childrens basketball hoop! Exciting times we’re in. Lookin good. Filed under 001 Imagination, 024 The Tradin' Post, intss blog by Marc Horowitz on Nov 22nd, 2003. Comment.